Iraq war veteran and UMass Amherst alumnus Ben Brody ’12, a photojournalist for The GroundTruth Project, says his most fluent language is photography. “If there is something to say, I know how to say it with images,” he explains. His way of understanding the world—its people, landscape, and the ebb and flow of daily life from Amherst to Afghanistan—is via a camera. At age 22, he used his camera to try to make sense of the world in the aftermath of 9/11 by enlisting in the U.S. Army as a combat photographer. “There was insane nationalistic fervor sweeping the United States, and I felt this would be a pivotal moment for my generation, and I wanted to see it firsthand,” says Brody. During his two tours of duty as a soldier, he carried 20 pounds of camera equipment to eastern Baghdad in 2005 and to the Triangle of Death, a region south of Baghdad that saw intense combat during the U.S. occupation of Iraq, from 2007–2008. Despite nearly three years in Iraq, Brody says he hungered for more experience with the U.S. military in Afghanistan. A tall, muscular man not to be undone by the near impossible, Brody crafted a plan to become a civilian journalist in the country’s longest war. Then a political science major at UMass Amherst, he switched his major to journalism, intending to arrange independent study in Afghanistan. In a course taught by Ralph Whitehead, professor emeritus of journalism, Brody met guest speaker Charles M. Sennott ’84, former Middle East bureau chief for the Boston Globe and cofounder of the nonprofit The GroundTruth Project. Brody had dinner with Sennott and made a pitch to work for GroundTruth in Afghanistan while earning credit for his UMass degree. “Afghanistan is a story very near and dear to Charlie’s heart. He produced an amazing multimedia piece called “Life, Death, and the Taliban” and when I saw it, I knew I wanted to work for him,” recalls Brody. He got his wish. His first assignment was a story on the Kajaki Dam in southern Afghanistan, which he says had become “a bottomless pit of fraud, waste, and abuse,” and may never produce enough electricity despite millions of dollars in American investments. Brody says he thrived on working on special projects for GroundTruth teams rather than “running from one breaking news event to the next breaking news event.” He worked on GroundTruth’s “Foreverstan: Afghanistan and the Road to Ending America’s Longest War.” This yearlong multimedia project documents the losses and gains from 14 years of war with a $1 trillion price tag, and the deaths of 2,000 U.S. soldiers and 20,000 Afghan civilians. “We were given the opportunity to tell that story in a completely engaging way,” says Brody. Brody says Sennott contributes much more to his work than editing copy or guiding reporting. “When you work closely with Charlie, you get to know his wife and four sons. You hear stories about his brothers. You go to his house and have a Guinness on this big porch. You become family,” says Brody. In a war zone, he says, Sennott’s utmost concern is safety, but that does not mean he is risk-averse. Brody recalls joining Sennott at the Qala-i-Jangi fortress, an Afghan military base and site of the first American battle in 2001. Their first problem was how to photograph the massive fortress, which is more wide than tall. They figured a drone equipped with a camera could capture an aerial view, but doubted the Afghan soldiers who escorted the American journalists would approve use of a drone. When the soldiers showed signs of boredom, Sennott told Brody to bring the drone on their next visit and program it to transmit images to a computer back home. The launch of the drone, indeed, set the soldiers off running toward the Americans but for naught, since the images had been electronically transmitted. “We were afraid we were going to be arrested immediately,” recalls Brody. But in the spirit of ground truth, they took the risk to get the story. Photojournalist Ben Brody ’12 produced Endgame: Afghanistan over six years while working for GlobalPost and The GroundTruth Project. Brody writes, “Rather than taking a strictly hard news-oriented approach, I have sought to read between the war’s lines, and there I have found relentless absurdity and alienation. “This war is personal for me, both as an American citizen and as a former soldier who fought in Iraq for more than two years. I believe this gives me a unique perspective and authority on my subject. My first day in Afghanistan was July 4, 2010. 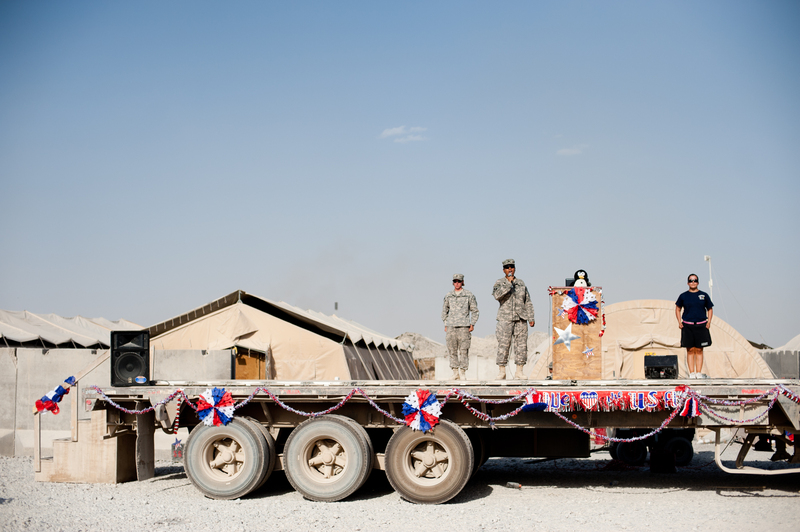 While waiting for a helicopter to ferry me out to a small combat outpost where I could cover the war proper, I attended the Independence Day festivities at Kandahar Airfield. A dozen other photographers and two television news crews were present, documenting the spectacle. It was the beginning of the troop surge, before the Arab Spring, and media interest in Afghanistan was high. A soldier sang the national anthem while a stuffed penguin held court from a podium. No holiday, no matter how small, can pass unremarked by soldiers at Kandahar or Bagram airfields. Home to the command staff and many support troops, these megabases offer broad choices of food and entertainment. Spc. Bobby Burton winces as he exits the Hell Hole at Camp Nathan Smith in Kandahar City, Afghanistan. The Hell Hole is the base’s burn pit, where soldiers burn plastic bottles, used batteries, paper, and food waste inside a gutted building. Burton and many other soldiers in Iraq and Afghanistan have complained of Gulf War Syndrome-like symptoms after prolonged exposure to the burn pits. Soldiers have litigated the right to sue civilian companies which operated burn pits, like KBR, but most burn pits were small and operated by soldiers themselves. Because the Taliban control the roads in Zabul Province, supplies have to be sling-loaded in with a helicopter or thrown from the back of an airplane. The CH-47 Chinook is known as Big Windy, and any loose trash around the landing zone is blown across the mountainside by its rotor wash. 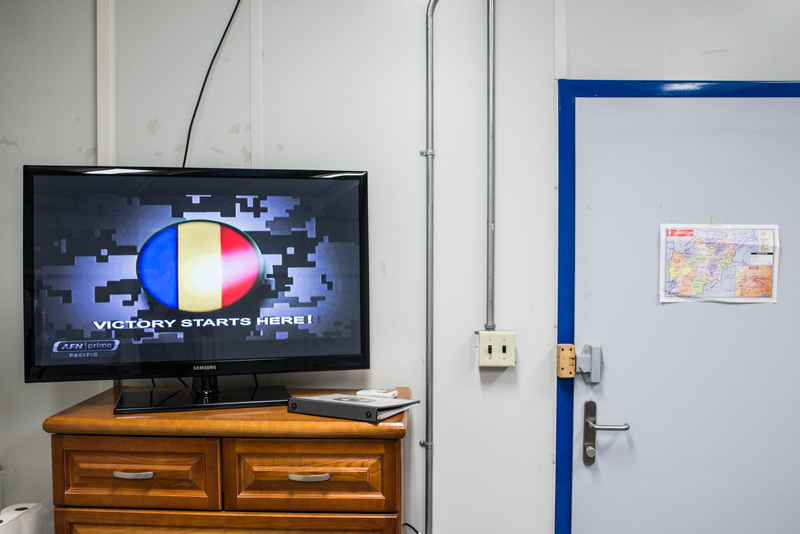 Soldiers at Combat Outpost Mizan have little control over what supplies they get, and when. Mizan can go two weeks without seeing an aircraft, and often there is no advance warning that they are coming. When the thumping rotors become audible, everyone runs out to the landing zone to see what Big Windy brought. 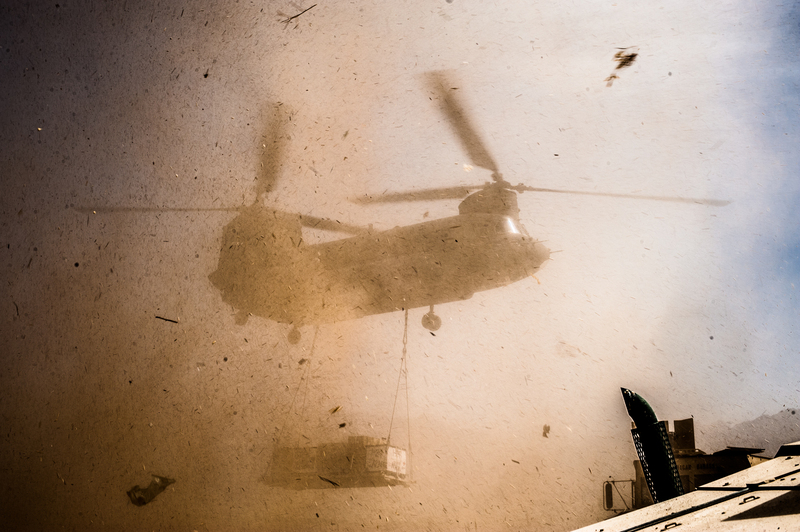 This helicopter brought in containers full of toilet paper and old mattresses—neither of which the soldiers had any use for. A soldier’s first real firefight, where the outcome is not certain, is something that affects every person differently. For everyone, though, it is the central rite of passage in the U.S. Army. A soldier who has been in contact with hostile forces is generally awarded a Combat Action Badge or a Combat Infantryman Badge—a metal pin which serves to visibly differentiate them from soldiers who have not fought. After fighting their way through a complex ambush high in the mountains, Pfc. James Gress, Pfc. Sheldon Meats, and Pvt. Ryan Greene rest on their way back to their base. They suffered no casualties, but inflicted many. The boardwalk at Kandahar Airfield was a square of about 40 shops catering to the NATO troops based there. You could buy pirated DVDs, cheap counterfeit electronics, high-end tactical gear, wheatgrass smoothies, and overpriced gemstones and carpets. The boardwalk made for world-class people watching. Dusty soldiers fresh from the fighting in the Arghandab, just 20 miles away, would gawk at their bright-eyed, rear-echelon counterparts struggling with armloads of Tim Hortons doughnuts and milk shakes. As the drawdown wore on, the boardwalk shrank accordingly. The TGI Fridays and the pizza place were bulldozed into rubble, to the dismay of the Afghan troops who would soon take over the base. 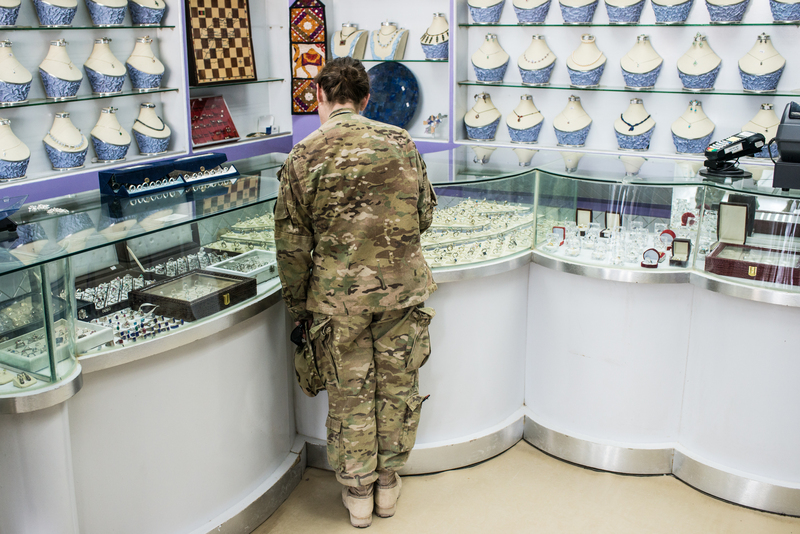 On Kandahar Jewelers’ last day of business, a soldier hunts for bargains. The store had been open for more than ten years. 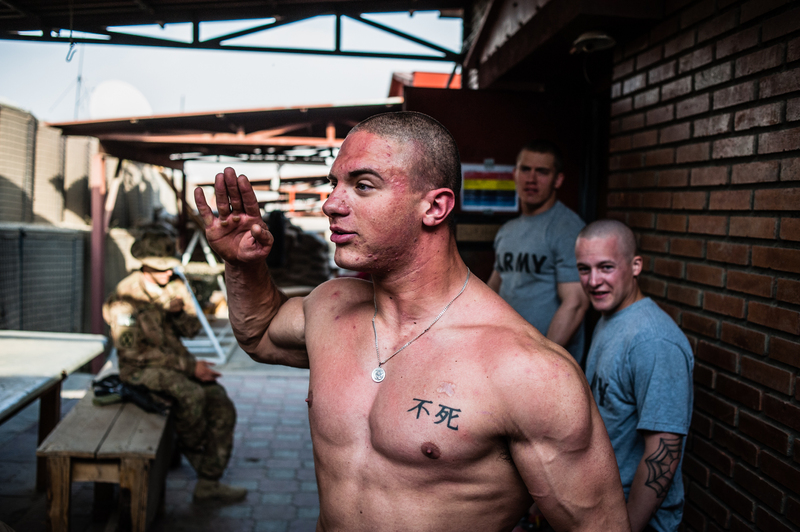 Infantrymen joke around during downtime at Forward Operating Base Tagab in Kapisa Province. During the drawdown in Afghanistan, soldiers on their first deployment or those who had not yet received combat awards desperately angled for any opportunity to patrol outside the wire. Life on a small base is boring and monotonous for men eager to fight, particularly when the fighting is occurring within earshot. 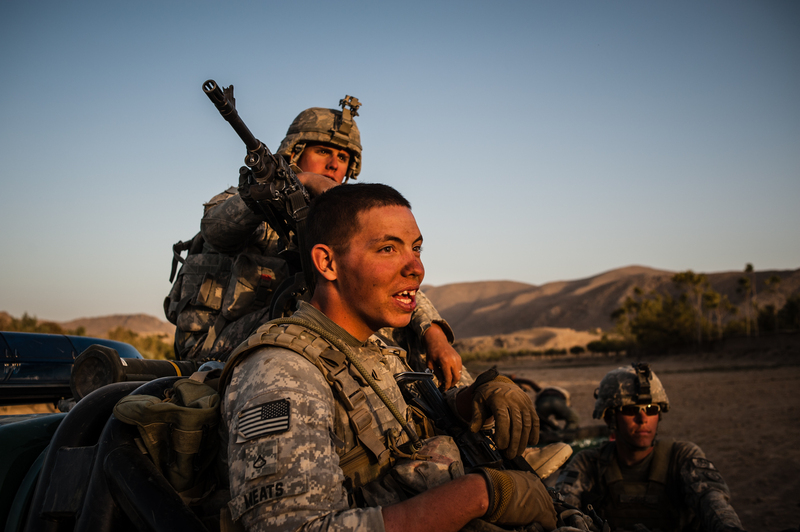 In Kapisa Province, American soldiers are confined to Forward Operating Base Tagab while Afghan troops engage in pitched battles less than a mile away. Instead, they find themselves confined within tiny bases for a year, where many of them obsessively lift weights and some use steroids. As the military fields more and more heavily armored trucks in Afghanistan, the Taliban plants bigger and bigger bombs. It is not a technological arms race—Taliban bombs have remained crude for the duration of the war, their components made in local barns, rather than in industrial weapons factories. Where the Taliban show increasing sophistication is in their use of propaganda. 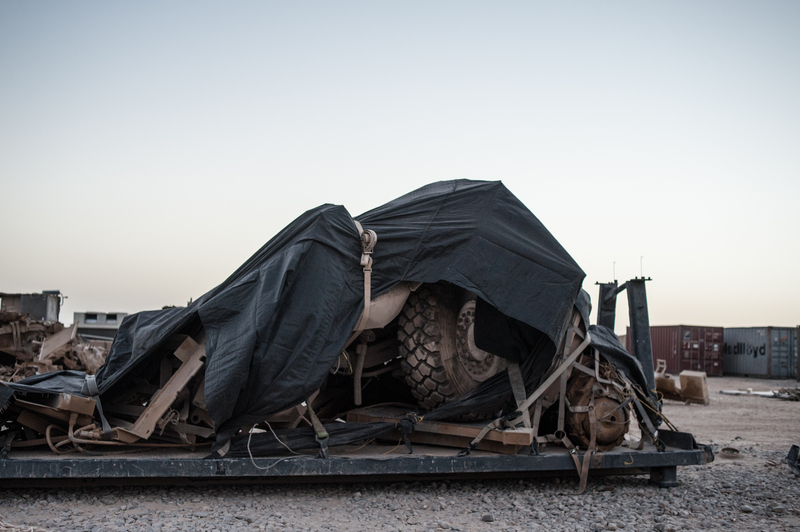 To prevent the Taliban from photographing destroyed American trucks for their recruitment videos, soldiers cover the wreckage with heavy black tarps before towing them back to base. 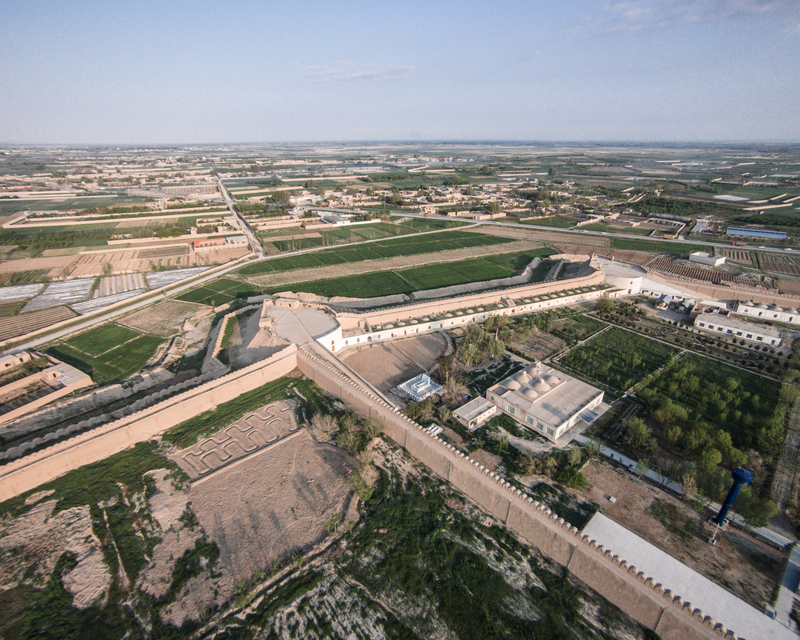 The 12-foot thick walls and massive battlements of Qala-i Jangi dominate the skyline of Mazar-i- Sharif. In 2001, hundreds of Taliban prisoners at the fortress broke into a weapons depot and staged an uprising against their guards in the first pitched battle of the American war in Afghanistan. After three days of fighting, and surrounded by Northern Alliance militiamen, special operations soldiers, and Western reporters, the few dozen remaining Taliban made their last stand in a small building in the central courtyard. John Walker Lindh, the “American Taliban,” was one of the few survivors of the final assault. He is scheduled to be released from prison in 2019. 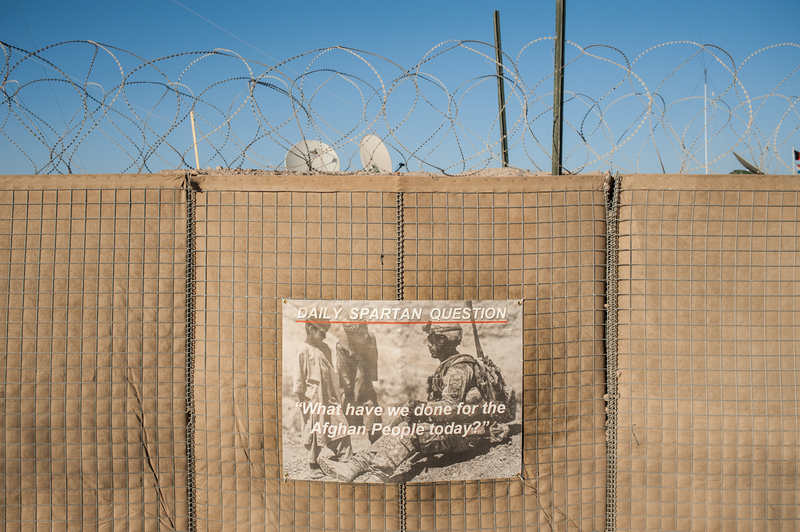 At Forward Operating Base Pasab in Kandahar, soldiers from 10th Mountain Division’s “Spartan Brigade” have decorated their concrete blast walls and plywood office buildings with motivational slogans. The posters exhort their troops to return with their shield, or on it, a concept attributed to the historical Spartan military. Some of the posters reflect current counterinsurgency doctrine, or make reference to 300, a 2007 action film about the Spartans’ Battle of Thermopylae. Kandahar Airfield’s distinguished visitors quarters is where reporters were housed during the drawdown. An Armed Forces Network broadcasts on a flat-screen television, showing a comically, one-sided view of American military operations around the world. Most independent journalists have left Afghanistan, and enlisted American Forces Network reporters and public affairs soldiers produce the bulk of the reporting on the ground in Kandahar. Before I came to Afghanistan as a civilian, I did two tours in Iraq as an enlisted combat photographer. 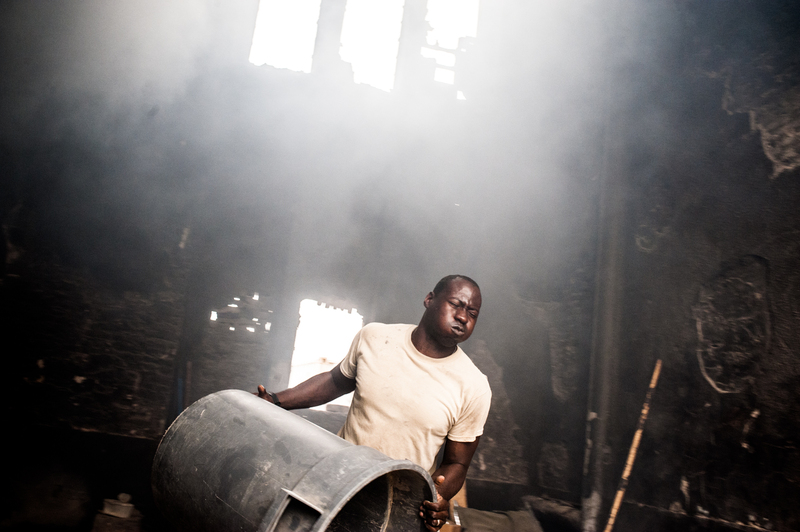 My job was to photograph military operations in some of the country’s most violent areas. While I was never prevented from photographing the relentless carnage of those years, I could only release to the public a sanitized, scripted version of events that had been approved by a colonel.